Despite the ridiculously mild weather, Autumn has started, the days are shorter but for salsa dancers in London that simply means the evenings are longer and thus more time to go out and dance (like anyone needs an excuse I hear you say). LondonSalsa.co.uk and our colleagues at LondonKizomba.co.uk and Bachata.Events work tirelessly to make sure that our listings are as accurate as possible, so that you can find the best parties plus the perfect mixture of classes, courses and workshops that'll ensure you feel comfortable dancing with any partner. Your salsa journey is very much unique, partially because different people start with different ambitions. 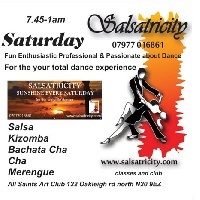 Some start knowing that dancing salsa can burn up to 600 calories an hour, so is perfect as part of a fitness regime. Others have heard and thence discovered the truly social side of our entertainment - the chance to meet new friends. And for some, this month, it will be the chance to escape the worries of life and instead reveal the Fred Astaire or Ginger Rogers within us. Whatever the reason that you started salsa, I bet your anticipation has been overfulfilled. My request to you today is to not keep it a secret. I'd urge you to bring a friend. They deserve to benefit from the blend. Why not take an improver, intermediate or advanced lesson and then catch up with your beginner friend for the social and practice times? Look out for the starred listings on site. Sometimes people say to me the the odd £1 or 2 off each lesson or event doesn't really make a difference. But I challenge you to think about it this way - save a couple of quid each week and it'll pay for a flight to a salsa congress later in your journey. Ask for your London Salsa special offer all over town! For those that scroll to the what's on this weekend section of the newsletter, here it is, with the reminder there is so much more on the sites or even the Global Dance Card app if you want London Salsa at your fingertips. Friday night's choices include the late night salsa party in Stockwell with Miguel and Mayana, or the free Funky Friday in Stratford with DJ Hughie, or the social following salsa and bachata lessons in Putney. Once in a while Pexava host a Saturday social at Conway Hall in Holborn. It has a top class dance floor, attracts the cream of the London social dancers On1 and On2, free water (thanks Gil for keeping the jugs topped up) and look out for your orange wedges at the end of the evening. It is the 1st anniversary for Salsa D'Lite in Bourne End this Saturday, whilst Salsa Calientita host their lessons and party in Slough. Fancy learning a smoother style to your salsa? At Bar Salsa in Charing Cross, Alastair and the Street Beat team have a 5-hour intensive workshop on Sunday (quote London Salsa for £5 off advertised prices). Quote London Salsa in Ruislip on Sunday for a £3 discount on the intensive salsa and pachanga workshop with #MinaQueenSalsa. For Sunday night,Bachata Kingdom is new for folks near Windsor, featuring2 hours of all level lessons, a bachata show and social dancing till midnight. Midweek lessons abound in London Salsa. There are simply too many for me to mention, so please do check out your options on www.londonsalsa.co.uk. New classes and courses are uploaded by the teachers and promoters every week, so if you haven't checked in for a while, please do. 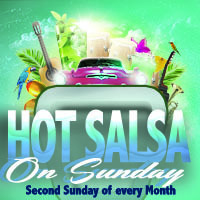 Mondays in Bar Salsa Temple offers a combination of cali style salsa and bachata with late night party. Deptford sees cuban salsa taught by Lee Knights and her team for all levels. 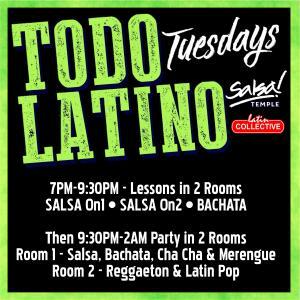 There are offers for everyone on Tuesdays in Salsa Temple with Latin Collective. 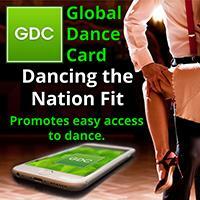 Take a free salsa intro or get added to the free guest list for the club night. In Northfields, there are drop in sessions for improver and advanced levels with Pexava before the hour for social practice. 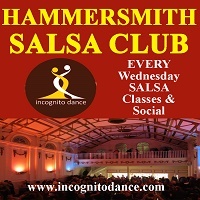 Hammersmith salsa club offer brand new beginners a free lesson, so bring a friend whilst you enjoy your own level of salsa and then take to the dance floor for the social. 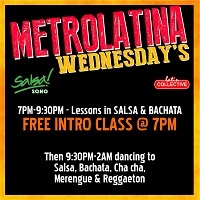 Bar Salsa in Charing Cross on Wednesday still offer a free intro to salsa session before lessons for all levels in salsa, cha cha and bachata - Thats Metrolatina. An El Grande in Kings Cross next Friday, and then Halloween parties at the end of the month! For something completely different, consider the dance and fitness retreat in Portugal.